Each month, many thousands of workers across the U.S. lose their jobs, while others find themselves newly employed. The net number of jobs created or lost in all this activity is an important indicator of the nation’s economic health. But the raw number of jobs created or lost from one month to the next doesn’t say much about the economy. Rather, many of these month-to-month changes are the result of predictable seasonal fluctuations. For example, the fact that the last ten Januarys witnessed the economy shedding over 2.5 million jobs is simply retailers slowing down after the holidays and says nothing about broader economic performance. 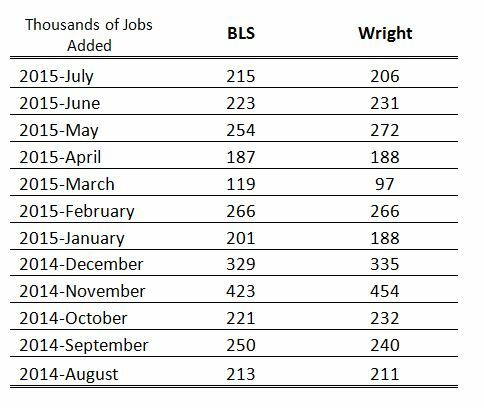 This year’s monthly job gains and losses can indicate how the economy is doing once they are corrected to account for the pattern we already expect in a process called seasonal adjustment. The approach for this seasonal adjustment that is presently used by the Bureau of Labor Statistics (BLS) puts very heavy weight on the current and last two years of data in assessing what are the typical patterns for each month. In my paper “Unseasonal Seasonals?,” I argue that a longer window should be used to estimate seasonal effects. I found that using a different seasonal filter, known as the 3×9 filter, produces better results and more accurate forecasts by emphasizing more years of data. The 3×9 filter spreads weight over the most recent six years in estimating seasonal patterns, which makes them more stable over time than in the current BLS seasonal adjustment method. I calculate the month-over-month change in total nonfarm payrolls, seasonally adjusted by the 3×9 filter, for the most recent month. The corresponding data as published by the BLS are shown for comparison purposes. According to the alternative seasonal adjustments, the economy gained 206,000 jobs last month. The Bureau of Labor Statistics reported that the economy gained 215,000 jobs last month. The discrepancies between the two series are explained in my paper.